Wetrooms UK use RIW Tilesafe and RIW FWM to waterproof the floors and walls in our wetroom installations. RIW Tilesafe has been designed to be used prior to the application of tiles, (including natural stone and porcelain) onto solid and timber floors in wetrooms and other critical rooms that require waterproofing. RIW Tilesafe is a heavy duty, cold applied, self adhesive waterproof membrane, consisting of a thick rubberised waterproof layer with a woven glass fibre mesh on one side. RIW Tilesafe provides wetrooms with a consistent waterproof layer that is guaranteed not to leak when installed effectively. Conventional tile adhesives can then be used, which will bond to the glass fibre mesh. RIW Tilesafe also acts as a valuable de-coupling membrane, as it allows the floor tiles to uncouple and accommodate any movement across the floor substrate. The membrane will also improve the sound insulation value (∆Lw) of a typical wetroom floor assembly by 11dB, as it acts as an acoustic barrier. Al of the tests were carried out in accordance with BS EN ISO 140-8, and the results (∆L) were rated in accordance with BS EN ISO 717-2. 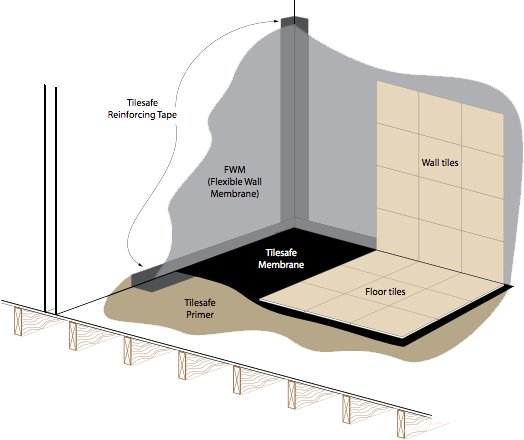 RIW Flexible Wall Membrane provides a flexible waterproof coating to walls prior to the application of wall tiles and natural stone in wetrooms and other critical areas that need waterproofing. The ready to use, solvent free, pale blue, soft paste, bonds to flawlessly to the adhesives used for applying ceramic tiles and natural stone to walls. FWM can be used on common wall substrates found in bathrooms such as plasterboard, gypsum or cementitious render, lightweight cement block or marine plywood. Please allow 24 hours before tiling.